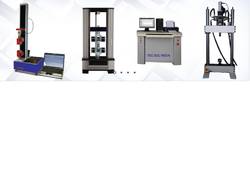 Pioneers in the industry, we offer tensile testing machine, computerised dynamic fatigue testing machine, long travel extensometer and cyclic and endurance testing machine for rubbers from India. 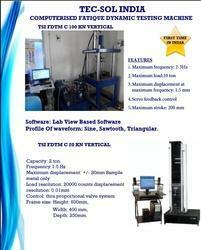 We are engaged in manufacturing, exporting and supplying theTensile Testing Machine. The Tensile Testing Machine is used for calculating the accurate measure of Tensile strength of materials by swift and simplistic approach. 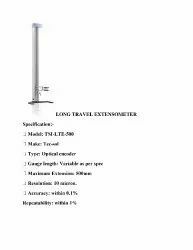 The Tensile Testing Machine is easy to operate and long lasting in nature. Manufactured under the keen observation of experts, buying Tensile Testing Machine from us will be the safest option for the buyers. ot only we present excellent products, but we are also flexible enough to make superfast deliveries and within the promised time. Stringent quality checks have been employed upon the raw materials which we source. For this, we have hired special quality analysts who check the materials against different parameters. 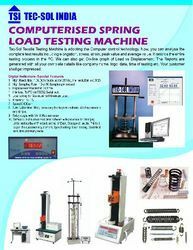 We bring forth highly advancedSpring Load Testing Machinein the market. We are a prominent Manufacturer and Supplier of Spring Load Testing Machine. The Spring Load Testing Machine is used for measuring the load on spring. It is used in various mechanical and engineering applications.